Michaela DePrince at her 2014 TEDx Amsterdam talk. Still via YouTube. Earlier this month we learned that former comp star and current UC Berkeley student Miko Fogarty will be giving a TEDx talk in March about her path from ballet to college. This news got us thinking about some of our favorite ballet TED talks from years past. Check out our top eight now! "The Physics of the 'Hardest Move' in Ballet"
Claudia Schreier: "Thinking On Your Feet"
Darcey Bussell: "The Evolution of Ballet"
Misty Copeland: "The Power of Ballet"
Robert Binet: "Challenging Gender Stereotypes"
Mackenzie Foy as Clara and Keira Knightly as Sugar Plum star in this new Nutcracker spin-off. Photo by Laurie Sparham, Courtesy Disney Enterprises, Inc. If there's one thing that dancers know well, it's The Nutcracker. From the minutiae of the plot to the choreography to Tchaikovsky's timeless score, we've got it down. Disney's new holiday film, The Nutcracker and The Four Realms, released in theaters November 2, is not a retelling of the ballet's story, and it's not a dance movie. 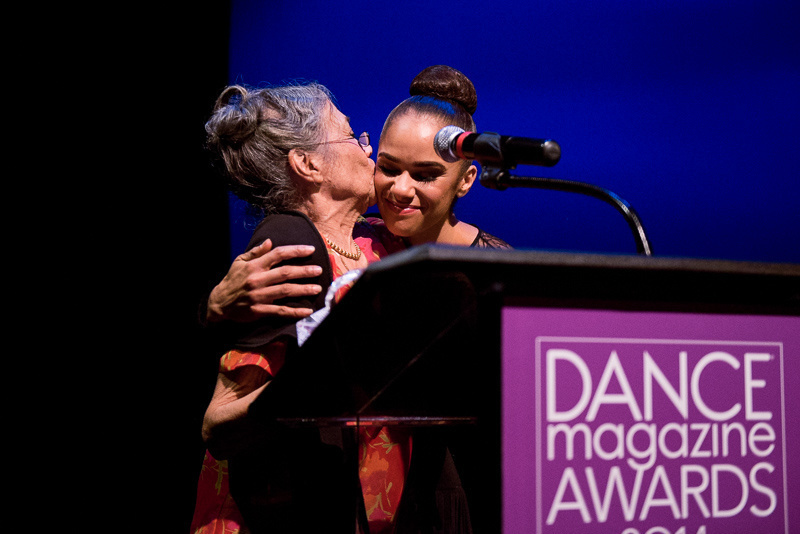 Nevertheless, we think there's plenty in it for bunheads to love (like Misty Copeland). Don't believe us? First, watch this featurette featuring Copeland, and then read on for four reasons why you might want to take a break from your Nut rehearsals to head to the movies. Familiar refrains can be heard throughout the film. Here's Clara, played by Mackenzie Foy, walking through a forest of Christmas trees. Photo by Laurie Sparham, Courtesy Disney Enterprises, Inc. Here's The Four Realms Mother Ginger, played by Helen Mirren. Photo by Laurie Sparham, Courtesy Disney Enterprises, Inc. Here's Keira Knightly as Sugar Plum. Photo by Laurie Sparham, Courtesy Disney Enterprises, Inc.
Misty Copeland and Sergei Polunin in The Nutcracker and The Four Realms. Photo by Laurie Sparham, Courtesy Disney Enterprises, Inc.
Misty Copeland models her fall collection for Under Armour. Photo courtesy of Under Armour. Fall is fast approaching, and American Ballet Theatre principal Misty Copeland has your back-to-dance wardrobe (and beyond) covered. The Under Armour spokesmodel debuted her Fall 2018 Misty Copeland Signature Collection earlier this week, playing off her first collection with another set of looks that work just as well in the studio as they do hanging out with friends. Misty Copeland works with a MindLeaps student in Kigali, Rwanda last week. Photo Courtesy MindLeaps. In 2015, Misty Copeland travelled to Kigali, Rwanda with MindLeaps, an international NGO that uses dance to help at-risk youth develop life skills. Up until that point, the program had only been available to boys; Copeland's visit launched MindLeaps' Girls Program. Now, three years later, Copeland's just back from another trip week-long to Kigali. MindLeaps does more than just teach dance. The organization uses free classes to draw vulnerable youth, many of whom are orphaned and living on the street, to safe spaces within urban slums. Once they're regularly attending dance classes, children are enrolled in programs in digital literacy, nutrition support, sanitation services, sexual and reproductive health, and academic catch-up classes. Eventually, the participants go on to boarding schools or to work-study positions, breaking the poverty cycle. "When you learn about the [Rwandan] genocide, you see how strong people had to be to survive. When you look at these kids today, you can see their resilience. Those are themes of my life too—to overcome all odds to succeed," Copeland told Pointe via email. Copeland's work with MindLeaps expands behind her visits to Rwanda; through her ongoing work with their International Artists Fund she works to represent the organization in the U.S. In 2015, she also founded a scholarship to send a promising student, Ali, to boarding school.